It’s just a foyer. I need to remind myself of that. But when this is the “before” shot, any change is going to feel epic. The amount of time I’ve put into thinking about what to put in this space is sort of insane. And here’s the crazier part, it’s actually not even a real foyer. You see, my front door opens into my living room so this is just a wall. Just a small space by the front door. But I’ve never had a proper entryway space so for years I’ve been dying to have a pretty console table with a lamp and a nice bowl for my mail and a place to put my handbag instead of on a dining chair (where it lived in our old house) or on the floor (where it goes now). We have no mudroom and this is the way we enter the house so in addition to this little vignette being decorative, it needs to be functional. So, I started thinking. And dreaming. And pinning. And the next thing I knew I had a Foyer Inspiration Board with 128 pins. That’s right. 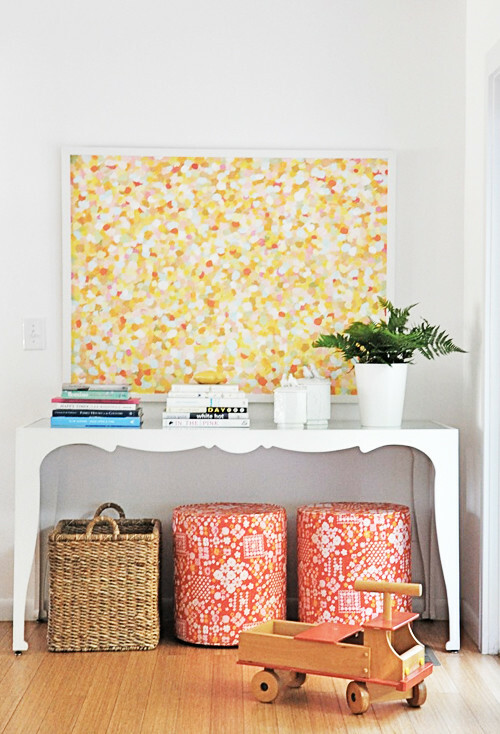 128 pins of foyer ideas. And the more I pinned, the more confused I got. I felt like I had a million different ideas swirling and I needed to start making decisions. The winner is: Open. Even though the idea of some extra storage was enticing, we have a heating/AC vent on that wall so I opted to go with something open. ….or should I put some stools or poufs or even a pair of dreamy x-benchs for extra seating? The winner is: Neither. Since storage was key, I found a table with a top and bottom shelf so there’s no space underneath for either. But I do plan on having some small stools to each side of the table. 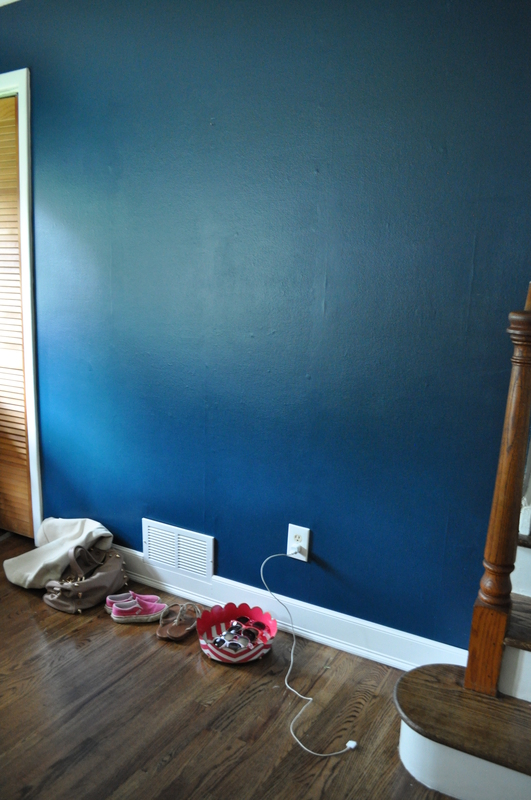 …or go for some symmetry (which is SO not my style but I kinda like for an entryway)? The winner is: The jury is still out on this one. I’m currently borrowing one lamp from the bedroom. The table isn’t super long so if I do two, they would need to be small. I think I’m leaning toward asymmetry though. I’m just more of an off-kilter kinda girl. …or an oversized mirror (in which case I’d use my grandmother’s old mirror that I’ve had for years)? The winner is: A little bit of both. Since the wall is teal, I already have some color so I’m keeping the furnishings clean and neutral. But this is my house, after all, so I’m sure there will be some color in the styling which is still a work in progress. Do you understand now what I meant when I said I was putting way too much thought into this decision? Oh – and keep in mind that like all things in my house, this needed to be done on a tiny budget. Like, as-cheap-as-is-humanly-possible budget. So tune in to my next post to see the table I ended up with and hear all about the INSANE deal I got on it. Make sure to click the link below to subscribe to posts by email so you won’t miss a thing. Images: I tried to link to original sources when possible, but in the cases I couldn’t find them, you can locate them all on my Pinterest board called Foyer Inspiration. Can’t wait to see the “after” picture!! I can’t wait to see how it all came together! You’re a rock star!!!! Want to help when I start doing mine?! Of course! I love a project!! !